Working with The Entrepreneur’s Source® can lead to tremendous success; such is the case with Kelly Miller, owner of the Junk King location in Tallahassee, FL. We sat down to talk with Kelly about his experience investing in a franchise. He had always dreamed of being a small business owner, and through his work with The Entrepreneur’s Source®, and a good helping of hard work and determination, Kelly has made that dream a reality. According to Nancy Norton, The Entrepreneur’s Source® franchise coach who helped guide Kelly through his journey of discovery, Kelly’s story is a phenomenal example of the kind of long term business success aspiring business owners can achieve when they commit to working within the TES coaching methodology. Q: To start off with, can you tell us a little bit about your background? A: My name is Kelly Miller, and the franchise that I own is called Junk King. It’s an eco-friendly junk removal service. I’ve been doing this for almost six years now and I love it. I have two little boys – 5 and 3, and my wife, Kristin, and I have been married since 2009. We’ve been in this together since I got in the self-employment world and she’s been very supportive through this journey. Q: And what about your career – Can you give us a little information on how you discovered The Entrepreneur’s Source®? A: I grew up in Idaho before moving to Tennessee at the age of 10, I ended up going to the University of Tennessee. I graduated in 2001 – it was a bit of a tough job market back then. I worked full time doing commission sales on electronics while in school, and after I graduated I was glad to get a job with a company that sells plumbing materials wholesale, Ferguson Enterprises. They gave me the option to relocate to Florida, so off I went. I started in the warehouse but quickly rose through the ranks by utilizing their training program. The work was hard, but I enjoyed it. I liked solving logistical problems and working on construction projects. I also did some side consulting for construction companies as well. After a while, I started noticing that things were slowing down. I saw the 2008 market crash coming, so I decided to leave the construction industry. I then went to work for Xerox doing state contract sales at the end of 2007. It exposed me to a more specific type of sales, but it really didn’t suit me. After a year or so, I got an offer from a small business, Rumbles Office Equipment Solutions and I jumped at the opportunity. It was my first time working outside of the big corporate world. The man I worked for, Fortson Rumble, is a self-made business success; I learned so much from him during my time at that company that I decided I didn’t want to work for anyone else. If he can do it, so can I. I was determined to own my own company, and so I quit my job and that’s when the Junk King adventure began. Q: How did it all start with Junk King and The Entrepreneur’s Source®? A: For the first time in my adult life I was unemployed. I tried to figure out what I wanted to do, and then I made a connection with my Entrepreneur’s Source coach. I had never thought of the junk removal industry, but when she introduced me to the Junk King franchise, it just felt right. I wound up going on a tour with The flagship Junk King franchise in San Carlos California, saw the work they were doing and loved it. Q: How did you finance your franchise investment? A: Unfortunately, the initial startup costs for Junk King were out of my price range. Financing that business venture was going to be tough, so we had to come up with some different options. My coach connected me with a company that helps you line up working credit. We felt bogged down a bit by money, but sometimes you have to invest money to make money and it paid off in the end. Q: What were some of the obstacles you faced when you first opened up shop? A: At first, we had some trouble with employees not showing up when they said they would. Finding good staff can sometimes be the hardest part of a startup. We opened in May of 2011 and luckily, in July of that year, we got a HUGE job. We pulled it off with rented equipment, temp labor and a lot of hard work. It was tough, but we did it. By September of that year, we were struggling a bit because we underestimated the effect of the local municipalities which would collect garbage and debris every two weeks – it was a bigger problem than anticipated. At this point, I knew I needed to take a different approach to my work. Q: I understand you had a fire in your warehouse – that must have been a pretty devastating setback! Can you tell us about that and how you bounced back? A: In July 2015, I got a call that our warehouse was on fire. I rushed down there at 3 in the morning, and there were literally five firetrucks putting out a huge fire in our warehouse. We didn’t own the warehouse space, but everything inside– the workshops, my offices etc. were all completely gone. We still had a separate warehouse of junk, but the revenue producing parts of the rental property were gone. I had employees and work lined up, but no equipment. It was a huge setback. I pretty much had to start all over again. In September of 2016, Tallahassee was hit hard by Hurricane Hermine. Trees were knocked over taking out power, and the whole city lost power, for an extended period of time. There was a chain of grocery stores that had no power and had to throw things out as a result. They called me and wanted us to clean out multiple grocery stores in the area. We ended up cleaning seven grocery stores that weekend. We had so much work to do, we needed to rent local trucks to empty out these stores. It was also a real crunch trying to get to the landfills, because they were closed for the Labor Day weekend – it was just madness. A month later, Hurricane Matthew hit the east coast and the same grocery store called me up and said there were a potential of 400 grocery stores that could be affected. I immediately started rounding up the Junk King Franchises from around the Southeast to try to handle this enormous project. We ended up cleaning 51 grocery stores over 100 hours from South Florida to South Carolina. It was a huge job, but we pulled it off. By building that reputation with this store, I know if there’s another storm, I’ll be the first person they call for help. I was able to coordinate everything myself because of my corporate background and my experience in property preservation. It was the perfect boost I needed to recover from that warehouse fire. We worked hard, never gave up and ultimately, we came out on top. The finances have worked out, and I’m really happy with the investment I made in my Junk King Franchise. Q: That’s quite the story! Can you tell me more about the role The Entrepreneur’s Source® played in this journey? A: Our TES coach played a huge role in my journey! To have someone else’s advice has been amazing. I never would have thought about a junk business on my own, but she introduced it to me. She knew it was a bit outside of my budget, but she worked with me and came up with a solution. I never would have been able to make it work without Nancy and The Entrepreneur’s Source®. She was always positive and really helped me through everything. I never would have found Junk King, let alone been able to work out the finances of the whole thing, without Nancy and TES. I just trusted her, and she hasn’t let me down. Q: What made Junk King the right fit for you? A: Nancy knew I like to solve problems, and I think that’s why instead of leading me down the path of a mundane franchise, she led me to Junk King. It’s challenging but incredibly rewarding. Every day is a new adventure. Q: So, if someone who’s relatively young and has been working in corporate business for a few years, would you recommend working with TES? A: Absolutely – if have been working in a corporate office for years you’ll have tunnel vision. Working with TES opens your mind to other businesses that you never would have thought of. Just make sure you do your research, ensure that you don’t underestimate your local competition (public and private sectors), and KNOW your region! Q: What’s your favorite thing about your coach and The Entrepreneur Source? A: She’s a problem-solver. She’s always ready to guide you and help get you pointed in the right direction. That comes with the experience and resources that TES has available. She’s still helping me with things like insurance, pay roll, everything. She is just a huge help and is always there when I need her. Until I talked to Nancy about these things, I was completely unaware of what is out there. There are so many tools and resources to help me run my business effectively that I wouldn’t know about without TES. I love the freedom that comes with running your own business. By working for myself, I’m able to go spend time with my kids, watch their school programs and have flexibility in my life. You just have to remember that being a small business owner definitely comes with responsibilities and a lot of hard work, too. A: I would love to get into another franchise! I’m not sure which one that would be just yet, but I’m going to keep my eyes open for that next opportunity. I’m also eager to keep growing with Junk King, of course. Especially my niche of natural disaster emergency cleanups. I’d like to think one day my kids will take over the family business. 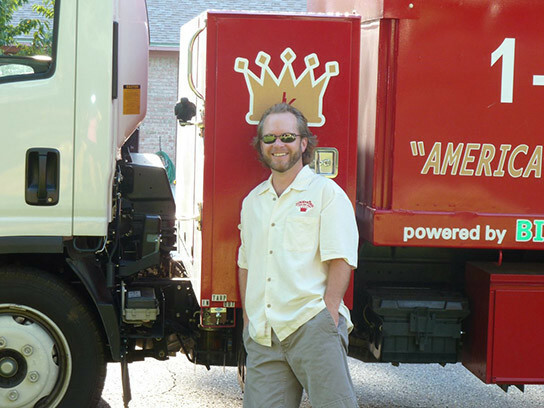 Junk King franchisee, Kelly Miller, discusses the importance of franchise coaching!